SINGAPORE — Greetings from the Republic of Singapore, the Southeast Asian city-state-island country that&apos;s roughly halfway between China and Australia. Though we&apos;re 9,364 miles or so from Chicago, about 21 hours on a plane direct with United, the question of thick or thin crust rages here too. 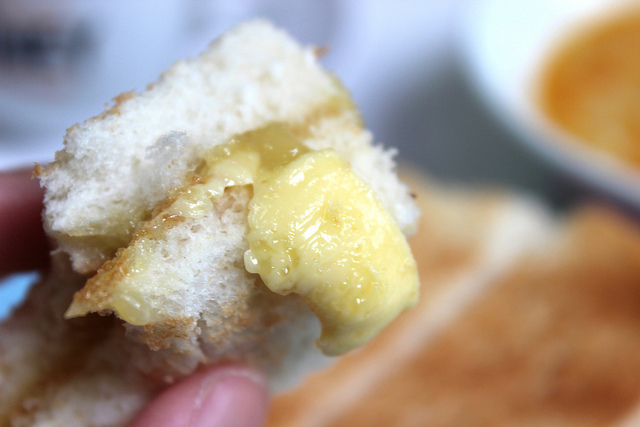 But in this, the Lion City, we’re talking about kaya toast, the national breakfast dish that consists of toasted bread spread with kaya then tiled with butter, served with soft-cooked eggs, and coffee. Kaya is a pale green, sweet coconut milk jam infused with pandan leaves which impart color and herbaceous flavor. 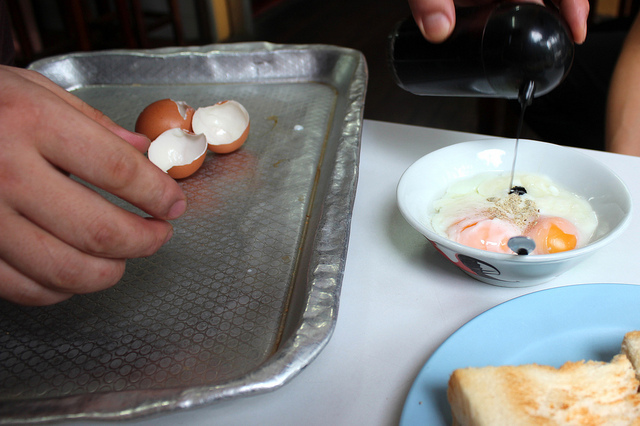 The eggs, always a pair, may be served in the shell or cracked in a bowl, but seasoned at the table to taste with white pepper and dark soy sauce. The strong black coffee, filtered through a fabric so-called sock, hides a layer of sweetened condensed milk at the bottom of the cup. 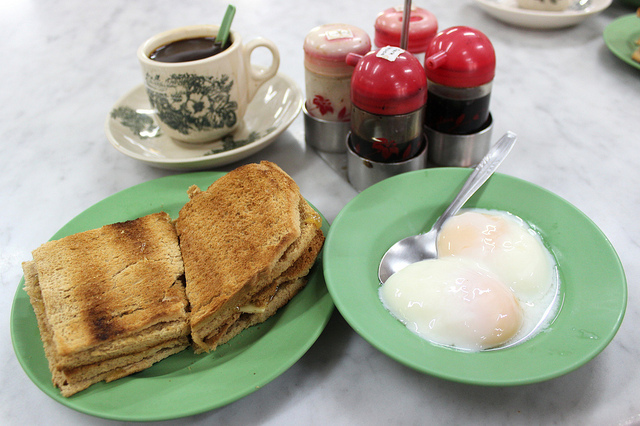 The kaya toast origin story has it that Hainanese Chinese galley hands adapted the foods they served aboard British ships, when they landed in Singapore and neighboring Malaysia, into the kopi tiam culture. Kopi is Malay for coffee, and tiam is Hokkien for shop, a perfect mash-up for this multi-cultural society. Traditionally the dense crumb white bread is grilled over charcoal then served already spread and buttered. 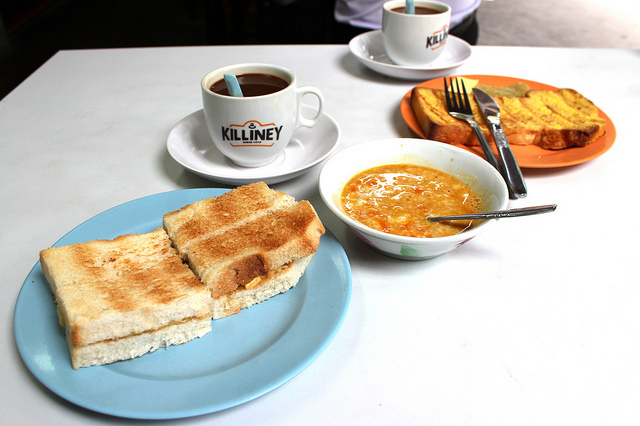 The original Killiney Kopitiam is the oldest coffeeshop in Singapore, established in 1919 originally as Kheng Hoe Heng Coffeeshop. 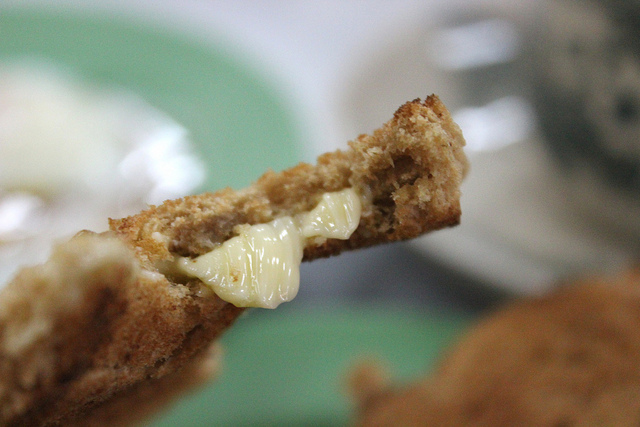 There, they grill thick slices of bread, then stud the kaya with squares of cold butter which soften quickly not only from the warm toast but perpetually tropical heat and humidity. Eggs are served in shell. At the original location of Ya Kun, they are of the thin crust school of kaya toast, and the butter is laid as wide-planed shavings. They crack the eggs, served in bowls warmed with water. 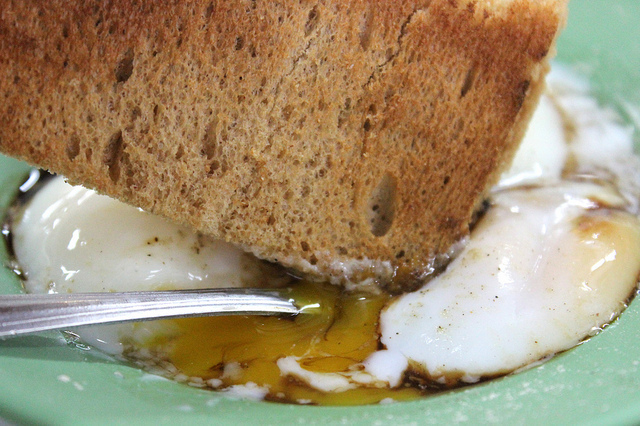 To eat, you dip your kaya toast into the eggs, to meld the sweet and savory, soft and crunchy. Like many of Singapore’s favorite food shops, both Killiney and Ya Kun have multiple locations, usually within futuristic malls super-cooled with “air-con”. But to get the real heritage flavor so valued here, it’s worth braving the intense heat, humidity, and crowds, through thick and thin.